Is it the purpose that drives mankind or vice-versa? Or maybe life itself is a dream? 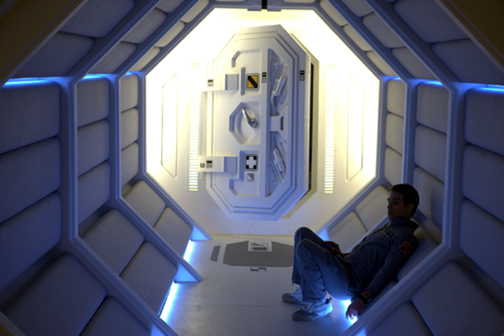 Reminiscent in diminutive parts of Kubrick’s 2001: A Space Odyssey, Moon takes various cues from Kubrick’s cult classic. While 2001‘s intelligent robotic assistant HAL continues to haunt us as technology’s Frankenstein whom we know not whether to love or hate, Moon‘s smiling GERTY (voice of Kevin Spacey) is a more pro-human version that sounds and looks similar to HAL. And although not as ambitious in the visual department as 2001, Moon does have various space scenes choreographed to classical music. Tarkovsky’s Solyaris, and Tom Hanks starrer Cast Away are other influences the movie draws on, albeit in a subtle and progressive demeanour. Comparisons apart, Moon has a life of its own that delves in to various realms about the extent to which science, and we as a species, might go to sustain ourselves and life on planet Earth irrespective of the ethicality of such methods. Moon also subtly depicts how such futuristic changes might impact us at a commercial, technological and psychological level. Directed by debutant Duncan Jones (singer David Bowie’s son), Moon steers clear of stereotype aliens, overblown visual-effects, CGI, et al. usually, and thankfully not always, associated with sci-fi flicks. In-fact, Moon is the story of the life and journey of one man and one man alone on the moon — astronaut Sam Bell (played by Sam Rockwell). Sam underplays his role with sublime perfection accentuating the minimalist and (Kevin) spacey mood of the movie. And although picturization too is underplayed and subtly done, Moon never comes across as a small-budget initiative (five million dollars as per IMDB) and has its heart in the right place — the soul of the movie, THE STORY. Like dark craters on the moon, Moon too has a sombre theme, is bumpy enough to jolt you when you least expect it, and is ‘one small-budget step for film-man Duncan Jones, but a giant leap for mankind‘ in the sci-fi film industry. Instead of falling in to the black hole of science fiction (sci-fi) mediocrity with run-of-the-mill flicks, give movies like Moon a chance. The gravitational force of Moon‘s astute and insightful subject is bound to draw you closer to your ‘self’ and re-invoke eternal questions such as: is it the purpose that drives mankind or vice-versa; what is life without a dream; or maybe life itself is a dream? Reminiscent in diminutive parts of Kubrick’s 2001: A Space Odyssey, Moon takes various cues from Kubrick’s cult classic. While 2001‘s intelligent HAL continues to haunt us till this day as technology’s Frankenstein whom we know not whether to love or hate, Moon‘s smiling GERTY (voice of Kevin Spacey) is a more pro-human version that sounds and looks similar to HAL. And although not as ambitious in picturization, Moon does have various space scenes choreographed to classical music. Comparisons apart, Moon has a life of its own that delves in to various realms about the extent to which science, and we as a species, might go to sustain ourselves and life on planet Earth irrespective of how ethical such methods might be. Moon also subtly depicts how such futuristic changes might impact us at a commercial, technological and psychological level. Directed by the relatively unknown Duncan Jones, Moon is devoid of the stereotype aliens, overblown visual-effects, CGI, et al. usually, and thankfully not always, associated with sci-fi movies. In-fact, Moon is the story of the life and journey of one man and one man alone on the moon — astronaut Sam Bell (played by singer David Bowie’s son Sam Rockwell). Sam underplays his role with sublime perfection accentuating the minimalist and spacey mood of the movie. And although picturization too is underplayed and subtly done, Moon never comes across as a small-budget initiative (five million dollars as per IMDB) and has its head in the right place — the soul of the movie, THE STORY. Tags: 2001: A Space Odyssey, Aliens, Cast Away, Duncan Jones, GERTY, HAL, Kevin Spacey, Moon, Moon review, Sam Bell, Sam Rockwell, sci-fi, science fiction, small budget, Solaris, Solyaris, stanley kubrick, Tarkovsky, Tom Hanks, visual-effects. Bookmark the permalink. There were many elements I enjoyed here (the moon cinematography, Mansell’s score, the Spacey-voiced computer/robot) and this was assuredly a solid debut for Duncan Jones…but ultimately I felt we’ve done this all before story-wise and it would’ve been “tighter” as just a short film. For me, it wore out its welcome after awhile. Hi David. The main thing that attracted me here was how the movie delves into the human psyche. And it did this without much hullabaloo. And with such a small budget I really wasn’t expecting too much. So maybe it really is about expectations some times. Also, this movie was clearly inspired by 2001. And though nowhere close to 2001, somehow, it touched me at a subtle level just like 2001. And I guess it’s no coincidence that you mention the word “short film”. At 97 mins running time, I actually did feel like I am watching (or maybe even reading) a short film/story. I personally wouldn’t want it any shorter than it already is. But maybe, Jones could have filled in some more “stuff” into the movie — maybe a more suspenseful plot.